This article is a review of BRAVE. “A lady does not place her weapon on the table,” Queen Elinor. Pixar was once a beacon, a rare gem, an oasis, [fill in your choice of analogy], in a sea of Hollywood anodyne and lazy dross. But dare I whisper it… they have been off their game. Three of their last four pictures have been less than stellar. CARS 2 felt like the STAR WARS prequels, an advert for merchandising. The first half of UP was extraordinary, the second semi-cooked. And that leaves BRAVE. The initial trailer had a bear as the big foe boded badly. It’s just the teaser I reassured myself. Little did I know how right my inner movie buff was. I kept willing something of note to happen. As time moved on, the benefit of the doubt was offered: This is just the warm up right? Wrong, the disappointing sense of lacklustre storytelling and characterisation linger, coupled with wide-eyed incredulousness at the lumpen dialogue exchanges. 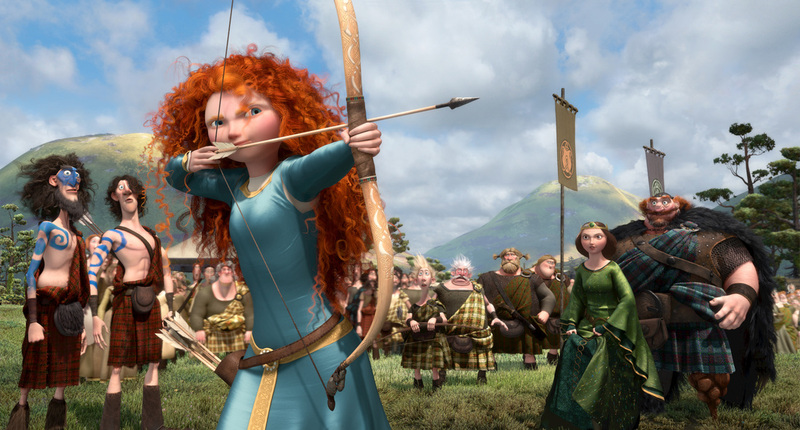 The story centres on a headstrong princess, Merida, who is pretty nifty with a bow and arrow. The Katniss comparisons end there. Instead of fighting for something bigger than herself, something significant, it’s a mother-daughter getting-to-understand-and-respect-each-other tale concerning forced marriage. A cartoon about poor communication, poorly communicated, gets wearing quickly. And then some magic is thrown into the mix. Not cool shizzle; instead the eating of a dodgy apple variety. There’s some contest to be worthy of Merida’s hand, and then the most ridiculous of plot threads to alter her fate. What was Pixar thinking? Maybe the Brain Trust thought, we’ve made a shoddy movie for boys with CARS 2, now lets do one for girls? TOY STORY 3 aside, where are the days of WALL.E and THE INCREDIBLES? They seem so far away. We have selected movies below that we think will be of interest to you based on this review. Using these Amazon affiliated links help us keep Filmaluation free for all film and arts lovers.